There is something so magical about Chile’s Atacama Desert. Last Thursday, my friends and I hopped on a plane from Santiago to San Pedro de Atacama for quite easily one of the greatest long weekends of my entire life. This is how we spent four days in the Atacama Desert, and how you can plan the perfect desert trip too. I haven’t stayed in many hostels before but I can honestly say that Hostal Rural is the most unique, lovely, wonderful and amazing hostel I have ever stayed in. It is so colorful and hippie-esque with hammocks and a ‘Chill Out Zone’ cave with fabric hangings as a make-shift roof and paintings all over the walls by the locals. Our hostel manager, Nacho, was the bomb and also gave us discounts on all of our tours. The whole place had such a relaxed vibe and everyone was super friendly. Unfortunately I lost all my photos of Hostal Rural, but you can see photos of it and book it here. To see more options of where to stay in San Pedro de Atacama, you can compare hostels and their prices here. Upon arrival we were told to be careful of altitude sickness by drinking lots of water and chewing on coca leaves. The Atacama desert is over 2,000 meters above sea level and coming there straight after being used to only about 1,000 meters above sea level can be hard to adjust to. Not to mention that many of the places we went to during our time in the desert, rose to more than 4,300 meters above sea level. Altitude sickness doesn’t affect everyone, but it does hit some people, and it’s impossible to know if it will affect you before you go. Even being young and in good physical health doesn’t guarantee that you won’t experience it. Most of my friends and I felt a little light headed on our first day and some had headaches. The more extreme forms of altitude sickness can include nastier symptoms such as diarrhea, nausea and vomiting. If not treated properly altitude sickness can even be deadly. Thankfully no one I was with on this trip experienced any of the harsher symptoms. Me with my trusty coca leaves. To best avoid altitude sickness make sure you hydrate with lots of water and sports drinks. Be sure to only go to higher altitudes during the days and sleep at lower altitudes. There are a lot of much higher places to visit from San Pedro de Atacama, so make sure that you don’t go to the highest possible spot on your first day. Let yourself acclimatize. Protect yourself from the sun, and don’t do too much strenuous activity on your first day. Be sure to also chew on coca leaves and drink coca leaf tea. Remember that the best thing to do if you do get seriously ill is to try to go to a much lower altitude. Coca leaves usually get a bad reputation as they can be made into cocaine. However, the raw leaf can be used to alleviate and prevent altitude sickness symptoms. You can either chew them and then spit them out, or pour hot water over them to make tea. They are used both in Chile, Peru and other places at high altitudes. While I was in the desert, I bought coca leaves, chewed them, put them in tea and always kept my water bottles full of them too. I can’t say for sure if I’m one of the people who just don’t get affected by altitude sickness too much or if the leaves worked some kind of magic on me, but I definitely felt more at ease having them on hand. For more altitude sickness prevention tips and what to do if you do get sick, read this article. Read this article for more information on how coca leaves can prevent and alleviate altitude sickness. Cooling off at Laguna Cejar. Photo credit: Rebecca Olsho. The evening that we arrived in the desert, we ended up just going out for dinner and relaxing at our hostel to better acclimatize to the altitude. Our first full day in the desert we decided to take a trip to the Laguna Cejar. The tour took us to Laguna Cejar where we could swim as well as a few other beautiful desert lagoons. However don’t let the fact that it’s a desert fool you. The water was freaking cold. If you are willing to brave the cold you can lay back in the water and float due to all the salt! We booked our tour to Laguna Cejar through our hostel, but you can also book your own half day tour here. The Laguna Cejar and other lagoons are only 20 km (12.5 miles) from San Pedro de Atacama. The tours also have hostel pick up and drop off included. Enjoying one of the other lagunas on the tour. Photo credit: Rebecca Olsho. One of the beautiful Altiplanic lagoons. We woke up early. Too early. In fact we thought our tour to the Altiplanic Lakes started at 6am so we all got up at 5am and got ready. Of course there was a miss communication of some sort because after walking around San Pedro de Atacama for about an hour and deciding to give up and go back to bed, we realized the tour was actually at 8:30am. Anyways we did get to the Altiplanic Lakes after all which were about 4,000 meters above sea level and absolutely stunning. Also it was extremely cold. When you’re that high above sea level, even the driest desert on earth is going to be freezing. Be sure to wear tons of layers for your trip up to the Altiplanic lagoons. Getting ready to go sand boarding in the Atacama Desert. Photo credit: Rebecca Olsho. That afternoon was definitely one of my highlights because we got to do something that has been on my bucket list for a while now. We went sand boarding!!! All the equipment is the same as snowboard equipment except you board down giant sand dunes. I cannot believe I actually got to do this. It was kind of tricky seeing as I’ve only snowboarded once before, and I definitely did a few barrel rolls down the dunes. I had so much fun that I don’t even care that even after a week of leaving the desert, I still have sand in places sand should never be. You can book sand boarding tours for the morning, evening or even moon-lit sand boarding tours late at night here. I still can’t believe I got to do this! Photo credit: Rebecca Olsho. Enjoying the sunset at Valle de la Luna. Photo credit: Rebecca Olsho. After sand boarding our guide took us to Valle de la Luna to watch the sunset accompanied by pisco sour (Chilean alcohol) and snacks (chips and peanuts). Once we got there I really had to pee and I knew I wasn’t going to enjoy the sunset until I was free to empty my incredibly small bladder. Too bad they don’t have baños (bathrooms) in the middle of the desert. I ended up walking for quite a while to some rocks that looked big enough to hide behind. Afterwards I was able to enjoy the beautiful sunset. It really was gorgeous and I miss the smog-free view already. Giving the ol’ thumbs up at the El Tatio Geysers. Photo credit: Rebecca Olsho. Yep I butchered that explanation but basically there’s a bunch of steam and hot water squirting out of the ground everywhere that looks absolutely magical early in the morning. Also there was one place where we could swim in the hot water, which was lovely since it was so cold up there. All the other places were too hot and dangerous to swim. In fact our guide informed us that the locals like to call the hot water “sopa de turistas” (tourist soup) because so many people have died entering the geysers. So, just make sure that you only swim in the geysers that your tour guides indicate are safe. Swimming in one of the geysers. One of my absolute favorite photos (and experiences) ever, thanks to my friend Rebecca Olsho. Beautiful sunset shot, courtesy again of Rebecca Olsho. Our Valle de la Luna tour took us hiking through the valley and through some amazing salt caves. The Valle de la Luna gets its name because the rock formations, reddish brown dirt, and incredible open starry sky at night makes it look like you’re walking on the moon. You can overlook the valley from the top and enjoy the incredible views, hike through salt caves, or appreciate the many different rock formations. Many tours will take you to the top of the valley for a beautiful view and some will provide you with pisco sour as well. Like I mentioned before, we booked all our tours through our hostel, but you can book your Valle de la Luna tour here. Our tour guide helped us take photos of the moon through the observatory telescope. The Atacama Desert is a worldwide famous place to stargaze since San Pedro de Atacama is such a small town and there is so little light pollution. I don’t know how we survived on so little sleep but after watching the sunset at Valle de la Luna again we decided to go on one last tour to an observatory where we could stargaze. We had a wonderful guide who pointed out the constellations Scorpio and Capricorn to us. He also showed us the Milky Way and let us see the moon, Mars, and Saturn through a giant telescope. It ended up being one of my favourite tours by far. Our guide also helped us take photos of the moon through the huge telescope. You can book an Atacama Desert stargazing and observatory tour here. Enjoyed our last desert sunset last night. Today we woke up at a reasonable hour and although none of us wanted to we hopped on a van back to the Calama airport. I made friends with a Chilean woman and her 11 month old daughter on the plane. She said she had been to Canada before so we talked about studying abroad and travel. Now I’m back in rainy Santiago. My hair and skin are so happy here because there is actually moisture in the air. I do wish I could have spent more time in the Atacama desert because it quite literally took my breath away but I am also glad to be back in Santiago. First thing I did when I got back was go to my favorite cafe, Cafe Palermo. And now finally I’m ready for a long deep sleep. Another photo from way up high near the El Tatio Geysers at sunrise. Photo credit: Rebecca Olsho. Some other things that I didn’t have time for, but would have loved to do while in the desert are listed below. I hope these suggestions help make your trip super enjoyable. Let me know in the comments if you’re going to Chile’s Atacama Desert soon or if you have any questions! Ride quads or ATVs through the desert. Visit the Piedras Rojas (Red Rocks) sandstone formations. See the Chacabuco ghost town (former saltpeter community and later prisoner camp). Visit the National Flamingo Reserve and Atacama Salt Flats at Laguna Chaxa. Make sure you also check out this list of places to eat in San Pedro de Atacama! Did you like this post? Pin it to share with friends! 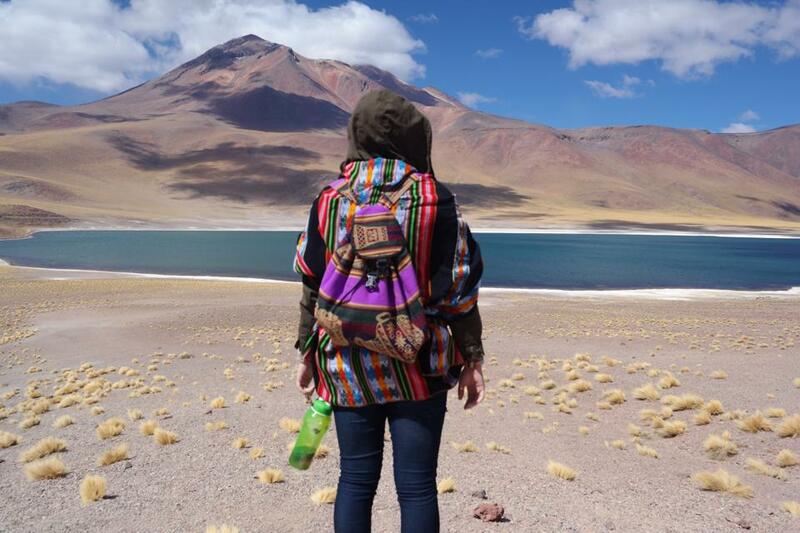 Planning a trip to San Pedro de Atacama? Get the best hotel deals below! I’m so glad you took altitude sickness precautions! I got altitude sickness in Ecuador and it was so so awful!